first of all, the winner of My Grandmother’s Knitting is Brooke K! yay. but mostly i would like to say how much i enjoyed hearing all of your knitting histories. i like the plain old boring way that fiber arts are passed on. i like that it’s through bloodlines or through friends. i like that it’s earthy and can be put down and picked up again, regaining the thread. one of the reviews on amazon said that this book was boring because all the knitwear designers stories were just family stories. knitwear designers are people too :) and those are the stories i love. p.s. there are still 2 more spaces left in the Falkland Fiber Club if you are so inclined. they’ll only be up until the 13th and don’t forget that you can also pay monthly instead of all at once. p.p.s. 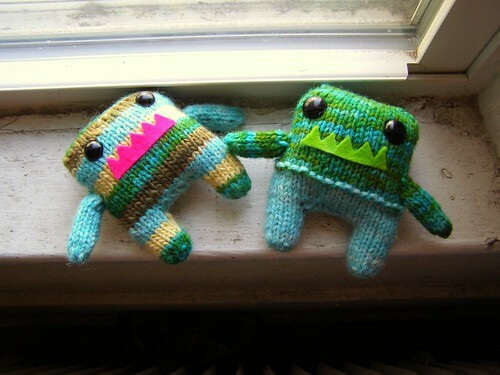 the little monsters are made out of little balls of hand dyed yarn (mostly). they’re for our friends who are turning one. raveled here. This entry was posted in cosyknitsliterally, knitting, toys by cosymakes. Bookmark the permalink. Those little guys are too awesome! Are you going to get the patterns up for the 2 pullover baby sweaters. Those are so cute.